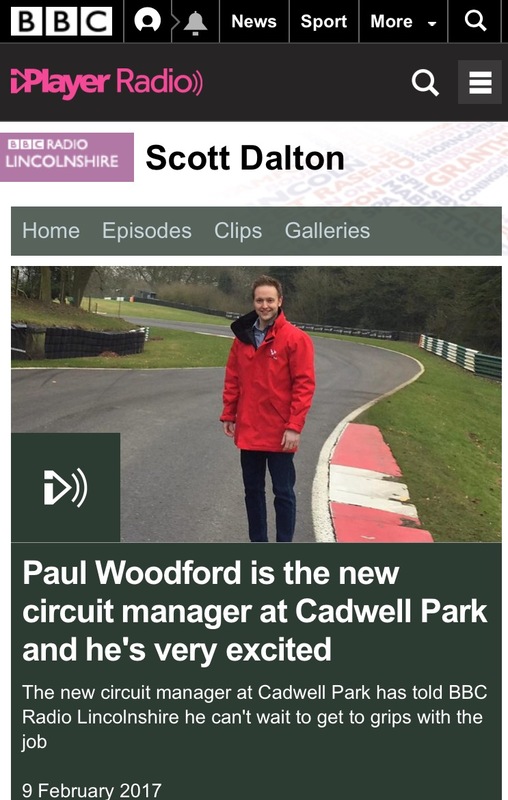 The news of my appointment as Circuit Manager at Cadwell Park captured the imagination of BBC Radio Lincolnshire reporter, Katie O’Halloran, so this morning I found myself meeting Katie at the race track for a chat about how the story unfolded. As fate would have it, Katie and I worked together at Lincs FM, when I was a presenter on Yorkshire commercial radio station, KCFM and she was working as a journalist across the group. So it was great to catch up again; both in our new roles, and introduce Katie to (a very quiet!) Cadwell Park. I’ve insisted that Katie, and perhaps some of her BBC colleagues join me at the circuit when there’s some action on track at some point this year, so keep a listen out. But here’s this morning’s Radio Lincolnshire Breakfast Show feature for you to listen again on iPlayer. I really appreciate the support that’s been shown to me by not only the local BBC radio station, but other local businesses who have been in touch to congratulate me. Cadwell is clearly a very big part of the community, and I fully intend to nurture those business, media and community links when I take post in March. ‹ Electric motoring, does it work in the real world?